My final recommendation for this past week and a half run is You’ll Never Know Book One: A Good and Decent Man by C. Tyler. This is a beautiful and moving memoir about Carol Tyler’s efforts to find out what happened to her father in World War Two. It is truly among the most accomplished releases of the last five years. Maybe ten. It is such a testament to how communicating through comics is a unique and singular creative choice of expression. 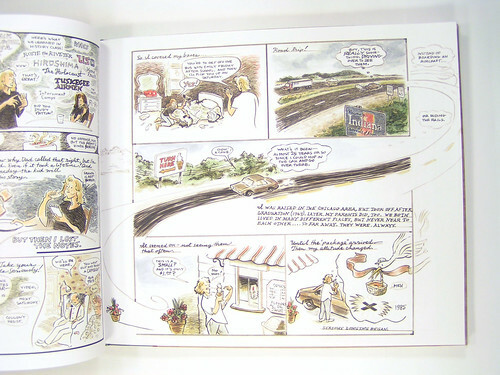 From the layouts of her pages to the physical production of the book itself, You’ll Never Know holds up in service of the story from cover to cover. Fluid and expressive, Carol takes us through her journey to unearth the secrets of her father, who after decades of adamantly refusing to discuss the past, is suddenly ready to talk. Somewhat. In the process, she discovers more about her family and herself than she expected. It’s a challenging relationship that Carol reveals with such sincerity, it’s difficult not to relate. The design of the book is meant to resemble a family photo album or scrapbook, and that’s exactly what Carol is making for her father. The story weaves in and out of two modes. The first is what could be seen as a behind-the-scenes look at what she had to go through to get this book made. The second is the scrapbook itself telling her father’s life history. A lot of storytelling devices are employed to accomplish this, but Carol’s skills as a cartoonist and illustrator, her cohesive style, warm coloring, and personalized lettering/calligraphy, all come together perfectly to tell such a layered story. It’s a faster read than I expected, but it lingers in the brain because of its richness. It stays with you and makes you think of your own family. This book was heavily featured in our second Dig Comics segment, where it was used to show an adamant non-comics reader that there’s something for her. There’s a really lovely moment between Carol Tyler and this woman that I will probably always remember. You can watch the segment below, as well as a look at one of the pages. Click on the image for a series of images. This graphic novel is the first in a trilogy. It’s followed by You’ll Never Know Book Two: Collateral Damage, released last year. The third and final installment is expected next year.